John explains why the post-1950s professional parenting experts have been wrong–almost all of them, about almost everything. They were wrong about the benefits of high self-esteem (in fact, it’s associated with anti-social behavior and depression), attachment parenting (there’s no good evidence of psycho-social benefit to children of parents who practice the 7 “Baby Bs” set forth by attachment guru Dr. Bill Sears), adoption (adopted children are not at higher risk of psychological problems of any sort), and spanking (children who are spanked score consistently higher on measures of adjustment than children who are not spanked). That’s the short list of “wrongs” that parenting experts have been guilty of. In this eye-opening book, John names the guilty parties and sets forth a parenting plan for recovery from their toxic messages. Web Exclusive: Hardcover, Autographed Book/CD Combo for only $19.95 ($25 value)! 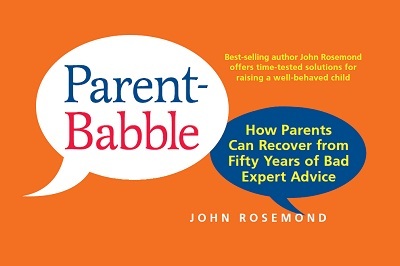 This autographed book comes with the our exclusive, special edition audio CD, "Parent Babble," which is one of John's talks on the topic of the same name. A $25 value for only $19.95! You will not find this deal on any other online retailer!